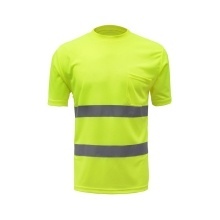 *Useful Safety Reflective T-shirt: Reflective warning T-shirt to protect your safety, reduce accident rate. Suitable for both day and night use. *High Visibility Reflective Stripes: With reflective bands around body, for warning and tips at night. Making your life shining and safe! *Made of Premium Material: Comfortable and soft, breathable and light weight, no burden after wearing. Easy to wash and quick dry! *Unisex and Applications: Suitable for women and men for traffic guidance, construction site, road safety, running, cycling etc. *With a Pocket for Daily Use: for cigarette, cellphone, pen, notebooks, ID/business cards, etc.